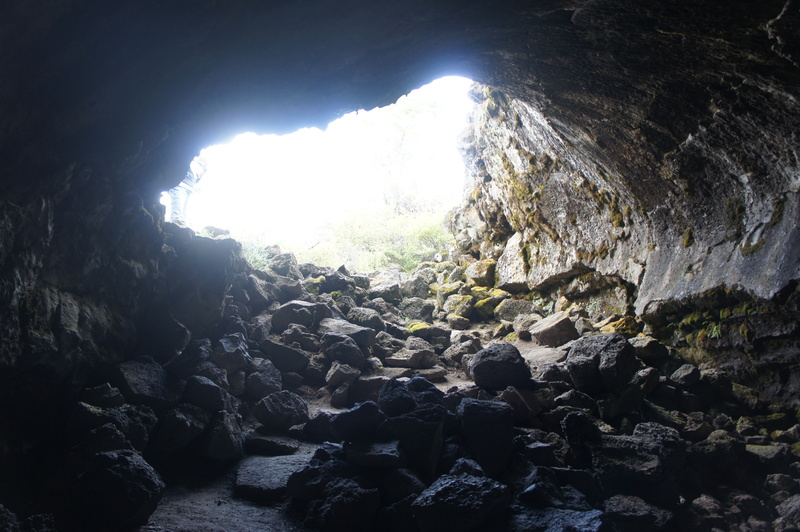 Sentinel Cave is the longest of the “easy” caves in California’s Lava Beds National Monument, as well as one of the only lava tubes in the park with multiple entrances. 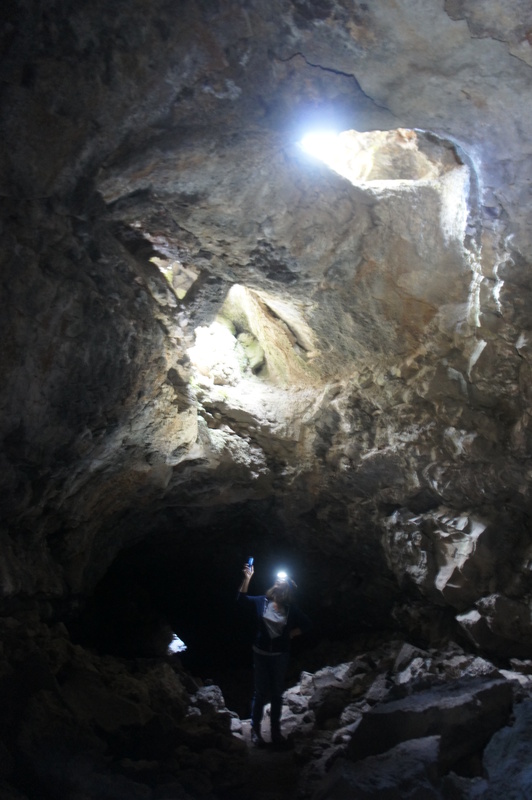 Inside the cave, the roughly 2/10 mile traversed by hikers is relatively flat and wide, making this a good option for small children with an interest in spelunking. Sentinel Cave is a section of what was once the “master tube” for the Headquarters System, the main thoroughfare for lava flowing through a complex network of subterranean passages. The hike begins with a ¼-mile, partly paved track that sets out across desert scrub toward the lower entrance. 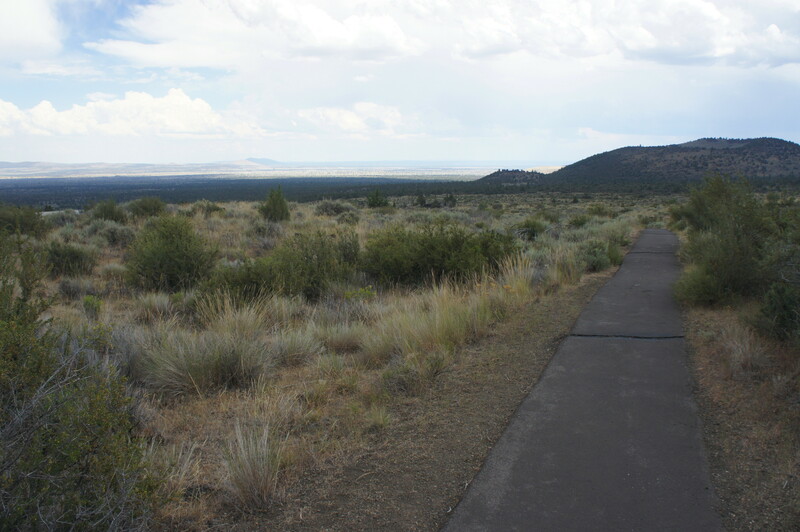 The towering mound to the southeast is Caldwell Butte (5,197’), one of several cinder cones in this volcanic area. After wrapping around to the north, the trail approaches the Lower Sentinel Cave entrance, a modest rupture in the lava tube that floods the cave with sun. Here the pavement ends, and a stony path leads down into the tunnel. 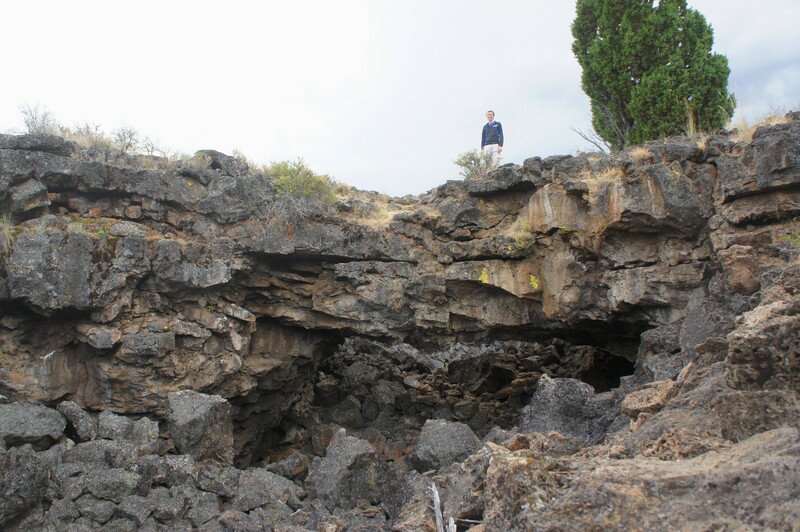 Once inside, a well-worn path cuts through a jumble of basalt, while a series of step marks on the right wall indicate various depths of the lava flows that once passed through the tube. A few minutes into the cave, just as darkness has set in, beams of light pour in again from a beautiful skylight. The roof between the two prominent holes in the ceiling forms a delicate natural bridge. Beyond the sunny cupola, the trail passes through a breakdown jam, and a smaller tube crisscrosses the main passage overhead. The next, left-hand bend features thick benches on either side. About halfway through the cave, hikers will reach a metal staircase, situated next to the pillar that gave the cave its name: The Sentinel, a modest spire on the right. Above the stairs, the path enters a large room littered with fallen boulders. The trail skirts the right edge of the breakdown. 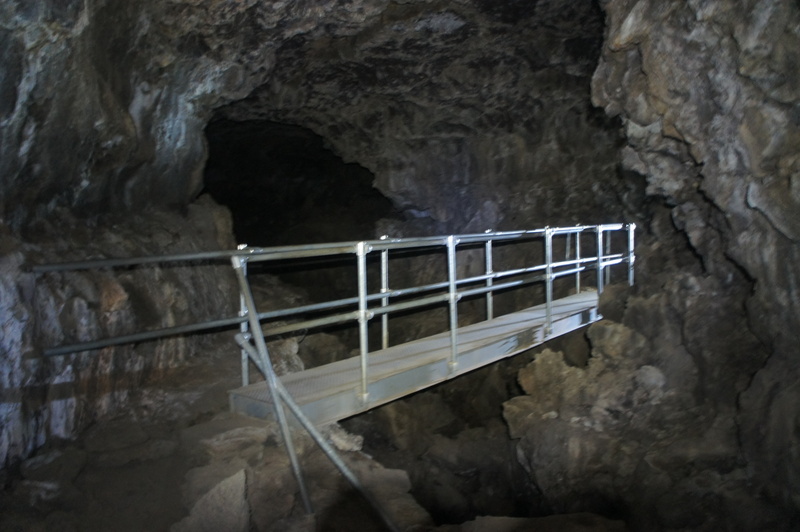 The next feature of note is a 7-foot pit, guarded by metal railings, that leads down to the cave’s lower levels. Here there is also a tube inside a tube, partly visible looking up-tunnel from just beyond the pit. Continuing marginally uphill, the path crosses a steel catwalk over a 15-foot chasm. Briefly diverting from the main passage, the trail weaves through a thinner side route that avoids the rocky jumble of the primary, collapsed tube. Soon enough, however, the two tunnels merge and the trail climbs another metal staircase. From atop the stairs, you can see the light of the upper entrance ahead. Weaving amid fallen basalt, the trail makes for the exit, emerging out into the sunlight again after about 2/10 mile underground. The Upper Sentinel Cave entrance is notably larger than the lower entry. Straight ahead, Sentinel Bridge crosses over the fallen trench of basalt rock; climbing up onto the bridge offers a good look at the entrance and landscape beyond. From here, bear right on the paved trail, which leads around 125 yards to the Upper Sentinel Cave parking area. Bear right on the road and follow the drive for another 1/10 mile to the Lower Sentinel Cave Trailhead, where your car awaits. 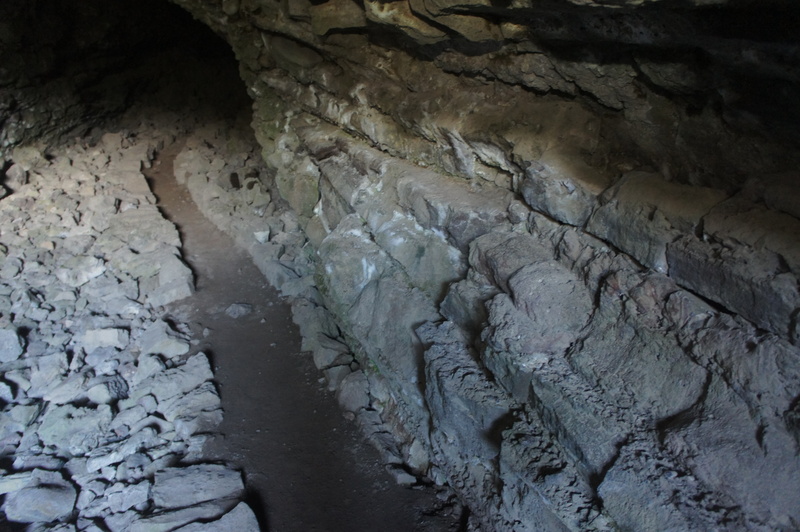 Allot between 30 minutes to an hour for this loop hike through one of Lava Beds’ best and most easily navigated caves. 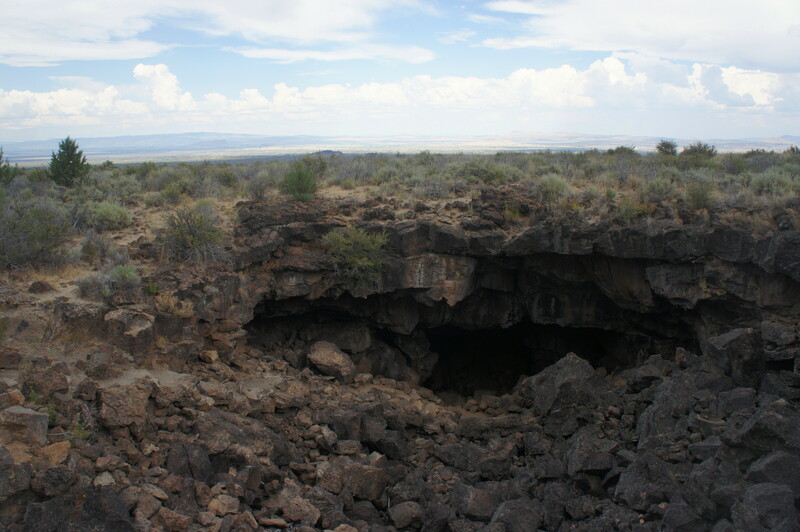 This entry was posted in California, Easy Hikes, Lava Beds National Monument and tagged California, cave, Lava Beds, lava tube, loop hike, Lower Sentinel Cave, Sentinel, Sentinel Cave, Upper Sentinel Cave. Bookmark the permalink.